Offering a formal, elegant look, the Amish Deluxe Side Light Curio Cabinet is a solid wood and glass showcase. This is a cabinet that demands attention in the dining room or living room. Here's the place you can display beautiful crystal, fine china, your grandmother's tea cups and more. 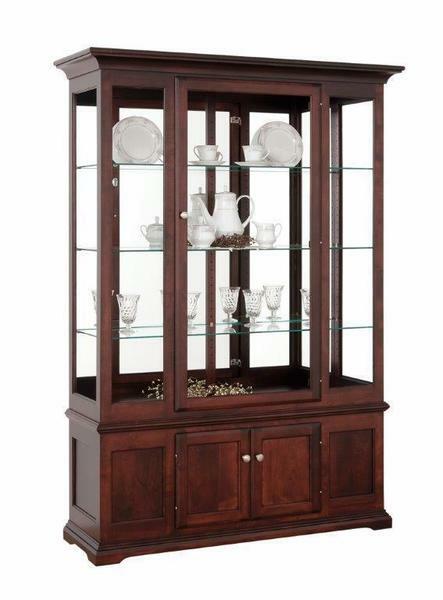 The Amish Deluxe Side Light Curio Cabinet is shown here in brown maple wood with rich cherry stain. Amish made curio cabinets are like no other. They offer solid wood craftsmanship with attention paid to all the details. We offer many custom options to make this curio cabinet unique for your home. It's available in six different wood choices with a number of finish options. You can order samples to work with at home to find the best wood type for your new curio. Add up to three additional shelves to create just the display you're dreaming of. Amish made furniture opens a whole world of possibilities with custom options that are available. Please email or call us today with any questions about our curio cabinets. We will be happy to assist you. Thank you for visiting DutchCrafters Amish Furniture.